Harun Mehmedinovic is perhaps more familiar with the country’s dark skies than just about anyone. After establishing himself as an award-winning filmmaker and photographer in Los Angeles, Mehmedinovic now splits his time between L.A. and Flagstaff. 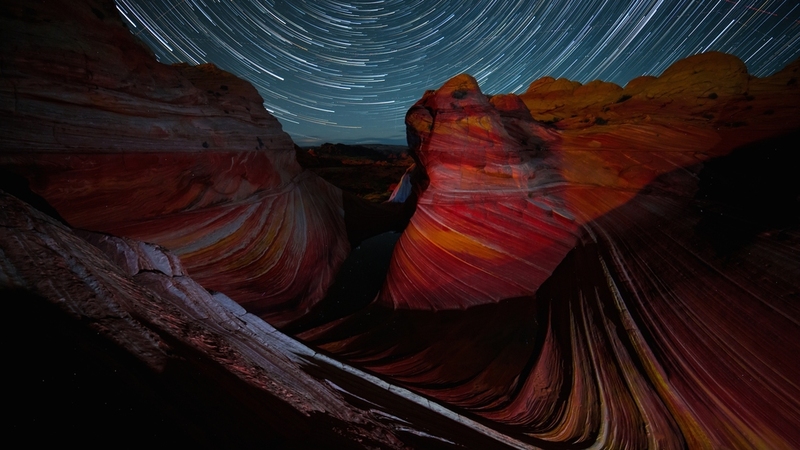 But he’s best known for his Skyglow project, a light-pollution awareness campaign highlighting the importance of dark skies and featuring Arizona’s incredible views of the cosmos. 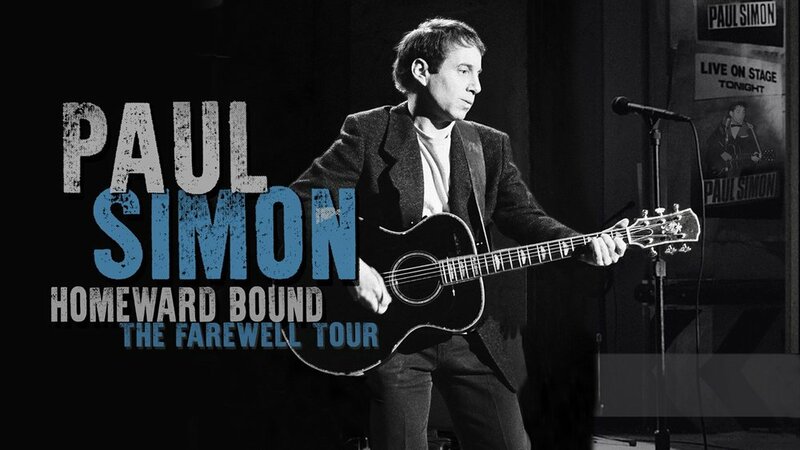 Harun Mehmedinovic and Gavin Heffernan of SKYGLOWPROJECT.COM have contributed some of the visuals for Paul Simon's Homeward Bound Farewell Tour, check it out starting in Vancouver on May 16th and continuing through the summer across North America and Europe. Harun Mehmedinovic and Gavin Heffernan of SKYGLOWPROJECT.COM have created some of the visuals for The Rolling Stones performances, including WILD HORSES and ANGIE, as well as Roger Waters performance of BREATHE at Desert Trip Indio. Skylight Studios welcomes photographers and filmmakers Gavin Heffernan and Harun Mehmedinovic for an evening of stargazing as seen through a presentation of their timelapse photography films and stills from their expeditions in search of the most breathtaking night skies in the United States. In 2015, Heffernan and Mehmedinovic collaborated on SKYGLOW, a crowdfunded book and BluRay set that tackles the rising danger and damage of urban light pollution. The fundraising campaign generated a tremendous amount of publicity and ended as the fourth most successful Kickstarter campaign in the Photobooks category. Pre-sale ticketing ends on December 4 at 11:30pm at Skylight Studios. Tickets also for sale at the door pending availability. All ticket sales are final. No refunds, exchanges or returns are permitted. Cost: $10.00. Pre-sale ticketing ends on December 4 at 11:30pm at Skylight Studios. Tickets also for sale at the door pending availability. All ticket sales are final. No refunds, exchanges or returns are permitted. Harun Mehmedinovic & Gavin Heffernan of SKYGLOWPROJECT.COM have their timelapses featured by the legendary Rolling Stones on their ZIP CODE Stadium Tour! Try to catch the tour this summer and watch out for MOONLIGHT MILE or WILD HORSES to play! SKYGLOWPROJECT.COM has concluded the epic KICKSTARTER campaign as 4th most successful Photobooks Kickstarter of all time! Missed the Kickstarter but still want to participate? Rewards are still available: BACK THIS PROJECT. Created in association with BBC EARTH (bbc.com/earth/world). Now available in 1080 HD! Please like the Facebook page for our exciting upcoming Kickstarter venture SKYGLOW (facebook.com/skyglowproject). Launching April 3rd, SKYGLOW is a unique Kickstarter quest where Gavin and Harun will explore the most exotic dark sky locations in North America, while examining the complex biological and psychological impacts of light pollution on society. Vermilion Cliffs National Monument in Arizona hosts some of the most unique landscapes on the planet, from the red iron oxide cliffs of its namesake, to the Jurassic-era petrified sandstone of White Pocket. This area features what some have described as "brain rocks" and "cauliflower rocks," possibly formed through earthquakes after the landscape was lithified from sand into rock. White Pocket sees very few visitors, due to an hour-long drive by strenuous sand roads often impassable due to rain and snow. As the second part of a BBC Earth timelapse trilogy, our shoot consisted of two days and two nights of intense conditions, including high winds, thunderstorms, fog heavy rain, and other obstacles. Despite the adversity, the tempest broke and some incredible stars shone through to put on a show. Shot on Canon DSLR Cameras. Star trails created using rotation of earth's axis and STARSTAX. Wide motion control cliffs shot achieved with Dynamic Pecrception Stage Zero Dolly. A stunning geological formation, known as the Wave, has been captured on film as never before. The Wave is found in the desert of Arizona in the US. It is an undulating formation of sandstone rock formed by erosion during the Jurassic period, which lasted from 201-145 million years ago. The film is actually a series of still photographs, over 10,000 in total, painstakingly stitched together by film-makers Gavin Heffernan and Harun Mehmedinović. Just a few days after the launch, a Timelapse collaboration between Bloodhoney* and Suncahser Pictures has reached nearly 100,000 views and has been featured by USA Today, Yahoo, The Weather Channel, among others! With Bloodhoney* the photographer shatters the monotony of everyday life and tempts fate as a matter of principle. A desire to escape the horrors of routine has shaped the 31-year-old filmmaker and photographer’s Bloodhoney* project, a series of portraits featuring Mehmedinović’s friends posed against stunning vistas in the great American landscape. Mehmedinović, who divides his time between Los Angeles and Flagstaff, where he teaches photography and film at Northern Arizona University, decided to compile the images in a coffee table book. The first title, Séance, came out earlier this year after one of the most successful Kickstarter campaigns ever. The next book, Persona, will be out in August 2014. “Whenever I visited my friends they complained about how their adult lives were chained to routine,” Mehmedinović says. “I suggested a photo shoot in which the setting would be determined by whoever I was shooting. They picked a location and I just went along with it.” Last April, Mehmedinović discussed his work in a TEDx talk, "Living in the Moment," at Atlanta’s Emory University. Bloodhoney*, the literal translation of the Turkish word “Balkan,” is about breaking free of self-imposed restrictions and being present in the now. The subjects sometimes wear beautiful gowns, in other cases they're completely naked. The models themselves, however, aren’t the most transfixing element of Mehmedinović’s images; instead, the viewer’s gaze is drawn to the compositional harmony between subject and nature. In one shot, a woman in a white dress is enveloped by a blizzard, her ghostly figure the focal point in a wintry landscape. 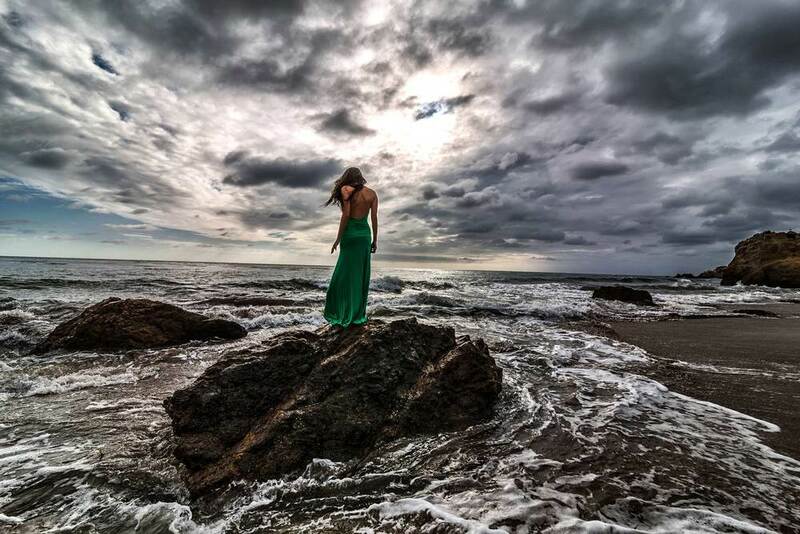 Another shows a woman standing on a rock in the surf, her stance recalling a figure in one of Romantic painter Caspar David Friedrich's works, which often depict a lone man contemplating his smallness in the face of nature. Grab your copy of the Blindfold Magazine, Volume VII at the official magazine website. Harun Mehmedinovic will be presenting the Bloodhoney* project at a Gallery exhibition at Galerie in La Jolla, California! Simultaneously, there will be a Bloodhoney by Harun Mehmedinovic book "Seance" reading and signing at the legendary Warwick's bookstore on November 7th at 7pm! Address: 7812 Girard Ave, La Jolla, California, 92037. 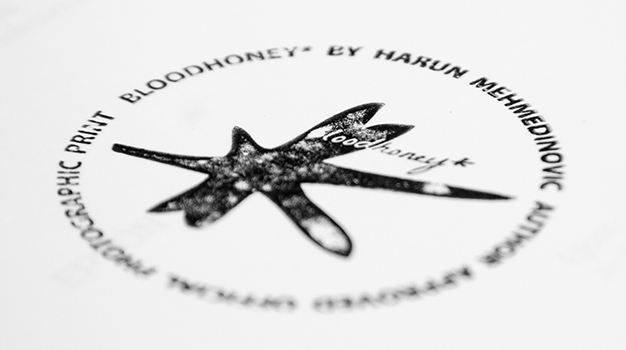 To keep up with the updates, please visit https://www.facebook.com/blood.honey.by.harun.mehmedinovic or www.bloodhoney.com and give it a "like." Harun Mehmedinovic guest-edited this issue of Blindfold Magazine, which also features Bloodhoney* photography. Pre-order your copy at http://www.blindfoldmag.com/shop/pre-sale-volume-4-generation-y! A filmmaker by trade, Harun Mehmedinovic took up photography as a hobby during his road trips across America. Years later, his project “Bloodhoney*” became one of the most successful Kick starter photography campaigns of all time. Harun’s photographs have been featured by major publications, including Vogue Italia and the Los Angeles Times. 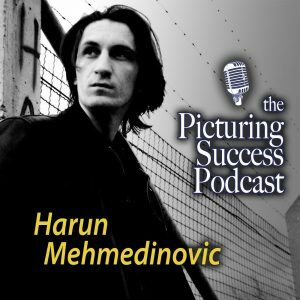 Prior to his venture into professional photography, Harun’s film “In the Name of the Son” premiered at Telluride Film Festival and won over thirty international awards including Shanghai, Savannah, and Cleveland film festivals. It was the first live action short film to receive an exclusive screening for the members of United States congress on Capitol Hill. Harun earned a Bachelor of Arts degree at the University of California, Los Angeles (UCLA), where he studied screenwriting and theater directing, and a Master of Fine Arts degree in Film Directing from the American Film Institute. Harun is represented by Creative Artists Agency and Anonymous Content. Bijan Tehrani: What inspired you to become a photographer? Harun Mehmedinovic: As a child, I fell in love with oral storytelling, which is now just about a dead art form in the western world. Although I was born in Sarajevo, I partly grew up in the countryside where many of my family members were hunters, and after their hunt we would gather around the campfire and they would tell stories of what happened that day. Of course, most of those stories would be embellished to say the least, or entirely made up, but they were always exciting and something about that experience was primal and struck a chord with me and still lingers. I was captivated, but never quite digested the true importance of stories until encountering Joseph Campbell. He has a quote that very much points to why stories are important: "I think what we're seeking is an experience of being alive, so that our life experiences on the purely physical plane will have resonance within our own innermost being and reality, so that we actually feel the rapture of being alive." Stories are ultimately reflections of someone's else's journey, recounts of a rite of passage, which has led to some sort of wisdom which they then pass on to those who haven't undergone such a journey as to empower them to seek their own adventures. This is very much what made me fall in love with Mark Twain's writings as a kid for example. As kids, we all connect with the adventures in his stories; we all want that sense of freedom and wonder, and a rejection of norms and ideologies. We all want to rebel, pave our own way through adventures, and experience that "rapture of being alive." Getting back to the question, I view photography as just one of many mediums for telling stories. With film being my first passion, I first learned photography through cinematography, which is somewhat a roundabout way to do so. Cinematographers usually get some of their practice in through photography, and I went about it completely the opposite way, and it has influenced my style as a photographer. I prefer dramatic, contrast feel to the images, as if they are still frames from a film, I think they have taken on a cinematic quality because of that. I first experimented with photography as a hobby about ten years ago, during my studies at UCLA. Twice a year I would drive from Los Angeles to Washington D.C. and back, along Route 40, photographing landscapes. It was a way to disconnect from the daily grind, have a rare moment of solitude, and re-charge for the following six months. I think this sense of freedom, wide open space, a certain release, led me to pick up a still camera again a few years later, but this time consciously, as part of a project, and for the first time involving human subjects. I say subjects as I would like to draw a distinction between models (who are there to serve the photographer) and subjects (who are there to be served by the photographer). BT: How do you pick your subjects? HM: When I was going around the film festival circuit, where I was screening a film I had made, I met old friends – some of whom I hadn’t seen in many years. Many were rooted in a 9-5 existence, living highly structured, stressful lives. They were stuck in that mode of always looking and planning ahead and constantly looking behind seeing if they met goals, but never living in the present. They rarely, if ever, engaged in creative or artistic endeavors. I initially wanted to involve them in my film projects, but that would have been very difficult to do at such a large scale, so I shifted my attention to photography.Instead of going to a coffee shop, I proposed that they take a day off, pick a place that has meaning to them, and choose clothes in which they feel like themselves. That was the starting point. From there the idea was to improvise; spontaneity was to be at the heart of the process. I wasn’t surprised when so many chose locations away from their work and place of living. Naturally, when given a choice, most of us want to get away for a day. Typically, early on in these shoots, my friends would ask me to give them instructions. Sometimes they wondered what they were doing there, perhaps feeling bored or frustrated. Slowly, their minds began to let go, and they started doing what they felt like: jumping, climbing, wielding props, and taking risks. It felt in some ways like a return to childhood, physicality took over and the camera was there to capture the energy of the moment, ideally telling a story. These "séances" sometimes went on for 10-15 hours. They included long hikes through mountains, head-on collisions with hail and snow, walks through swamps and lakes, and quite a few mosquito bites and bruises. Ultimately, there is something exhilarating and primal about that kind of experience, a head-on collision with nature. It’s genetically embedded. One can’t help but be in the moment, in the present, with heightened senses, acting on impulses. Because of the nature of this process, the experience of the day was most important, not the resulting images. You could never predict what would come on any particular day, and the idea was to let go and let things come together by circumstance. This is very opposite of the notions of safety and caution that we are bombarded with by the current society. Although being in front of the camera while letting go may seem uncomfortable, after these "séances," just about every one of my friends wanted to keep going, do it again. Each shoot was its own unique adventure with its own surprises. That rush of adrenaline, feeling of being a child again, uninhibited no matter how silly or dangerous, was liberating for myself as well. I had to be there in the present, following the person, shooting without interjecting and letting go to instincts as to where to be at any given time. It was a therapeutic experience for everyone involved more often than not. BT: One can see a lot of movement in some of your photos, they are like slices of a life on the move, is that a result of this process you describe? HM: I am following a subject around and snapping away, sometimes they stop, sometimes they keep going, but I’m always on the move finding the angles that best capture the moment. Sometimes the instincts are in the right place, and I capture those split second moments, other times things may be moving too quickly, but it’s important to let things come as they may and not interject. Ultimately, the experience of the moment is what counts, so it’s important for me not to break up the flow and constantly remind the person the camera is there. Often, they are in their own moment, in their element, and I need to be right there with them and capture it as it unfolds. Of course, that controlling photographer part of me often sees those moments that go by without being captured for one reason or another, whether it is that I’m moving to try to find an angle, or something else. It can be frustrating, but that’s part of the beauty of the process, it helps foster instincts and suspends overthinking. BT: How much time do you spend preparing for a shoot? HM: In the case of this project, very little outside of making sure the equipment is ready. I rarely use anything besides a camera, as things such as tripods would make it too difficult to be constantly mobile. I refrain from use for flash as to not bring in a distraction; rather I depend on the natural light in all situations. Also, these shoots sometimes take an entire day, so part of preparation is getting good rest. Early on in the project, I was quickly reminded how out of shape I was at the time. Five to ten mile hikes while carrying a heavy camera and an even heavier backpack would burn me out entirely by the end of the day. The adrenaline carries you only so much, then it’s a complete crash. For the first time in years, my mind and body were being put to a test simultaneously, and I loved that. I think the same was true of my subjects. BT: You mentioned this cinematic quality of your visual approach, could you tell us more about the role that locations, shapes and colors play in your photos? HM: I think this very much ties back to the process of photography I described above, many locations being their own surprises, it's about being open to that idea and not try to control it. I like to capture "ordinary" spaces in such a way that they appear extraordinary, because in many ways they are extraordinary. We take everything around us for granted, but remember how we all viewed the world as children. It was an amazing place, full of wonder. One just has to take chance and be open to surprises that the day brings. For example, on one of the shoots, we went up to Mt. Wilson, 30min from L.A. to shoot in the early morning fog in what was forecast to be a sunny day. We got there and the biggest hailstorm in the recorded history of Los Angeles began. Most people would try to get off the mountain as soon as possible, in fact, I only saw two more cars on the mountain road that day, so nobody wanted to go and experience this amazing wonder even when the TV stations reported about it. For me, this was the enormous miracle one hopes for on a shoot, the dusty desert landscape turned completely frozen. It was an image that place had seen maybe once or twice in an entire century and never in recorded history to this extent as I later found out on the news. It's a moment we couldn't have planned out, and its moment we likely won’t be able to recreate in that place again in our lifetime. This was all about taking a chance, going somewhere, taking time to observe and inviting surprises. Rumi, the great Persian poet once wrote: "Observe the wonders as they occur around you. Don't claim them. Feel the artistry moving through, and be silent." With that being said, there are also locations which have a distinctly different energy about them, quite simply something in the air that feels different. A good example for this would be places like Harper's Ferry, West Virginia, where the Civil War is said to have begun when John Brown was caught and executed, or a place such as Antietam battlefield where thousands of men died in a single day. The first time I went to Harper's Ferry, I had no idea of its history. I was a kid still in middle school and I remember not even wanting to be on that trip that day, but I felt something about the place and it stayed with me, and learning the history only shed part of the light on this. Places such as "Head-Smashed-In Buffalo Jump" in Alberta, Canada where Native Americans of the Plains used to send thousands of buffalo over the cliffs in what has to be the biggest annual hunt world has ever seen. This process had been done for thousands of years; underneath those cliffs are layers and layers upon buffalo bones over hundreds of centuries. That place, although completely unrelated to Harper's Ferry, had a similar feel. The sheer sublime was in the air and it was undeniable. The place itself demanded more than a moment of solitude. In fact, America is full of these place where the sublime of nature meets the sublime of man and leaves behind a tangible tension in the air. I think the subjects of these shoots felt this too, as do many people who visit these places every year. BT: Are you using any computer image editing in order to process your photos further more? HM: I primarily work to enhance contrast and produce accurate color as far as post production goes. I try to achieve the highest dynamic range in-camera, so I could have freedom to salvage details in light and dark areas of the image. I also find texture to be important. Ultimately, I would like the image to evoke an emotional response, an intrigue, and questions on part of the audience. I enhance the image only as much as it's needed for the mood and tone to be best communicated. As I come from more of a fine arts rather than journalistic background as far as photography and education goes, I am not a purist of the form. I like to experiment, and am not afraid to make mistakes in that process. Many of my photography friends have a very firm stance against post production of images, and perhaps that serves their purposes them best so I will only say that I like to leave doors open to all possibilities. BT: How is it working in film versus photography? HM: Much less intimate. What photography allows me to do it be entirely spontaneous and impulsive. Little to no planning, just going out there and letting things happen as they may. It's perfect for certain type of stories. Film on the other hand transports you into an entire other world, a highly sensual experience. Film is my first love and I have wanted to make film since an early age, and it is something I will dedicate myself to on my next project as the story is perfectly suited for it. Primary challenge in film is chemistry of collaboration. Assuming that is necessary has been done to draw up the blueprint, as in, write the script, that is merely the promise but the filming process will determine the end result. Making any film is a tour de force, it's a massive in scale compared to photography even if it's a small independent production with a small crew. Given the amount of money involved, decision making is another challenge, getting everyone on the same page, getting everybody to put film first and egos and other considerations second. While it is important to start from a great script, great concept, I found it just as important to allow the project to breathe, not to try to execute everything to perfection and suffocate everyone involved. Ultimately, it has to be a beautiful symphony where everyone else involved brings something to the table that I was a writer/direction did not. When everyone is fully behind it, putting all their love, all their passion into it, the whole will be greater than sum of its parts. That is not to say collaboration and chemistry plays no role in photography, it absolutely does as trust has to be established between me and the subjects. I am there with them, not to impose my will on them, they have to trust me to open up and be they. However, with a film, you have to multiply that by hundreds. It's a massive undertaking with many factors; making a great film is not an easy thing to do. Many things have to come together, but if the concept comes from a genuine place, and there is passion and fervor driving the process, in my experience things turn out well more often than not. I love both of these mediums. BT: Are there photographers that have influenced your work? HM: As far as stylistic influences, they come mainly from cinematography, as that is where I started. Guys like John Seale, Christopher Doyle, Vittorio Storaro, Darius Khondji, and Conrad Hall, among others. I also have to credit certain painters, especially Caspar David Friedrich and Caravaggio. I have always been drawn to strong contrasts, deep, rich blacks in particular, and I think I owe much of that to those influences. I only began to appreciate photographers later, I think what they do is far more understated by nature. We as observers tend to take photos for granted, especially today when we are bombarded with images. I had come to appreciate two photographers in particular, Henri Cartier-Bresson and Joel Peter Witkin. Bresson for his talent in capturing particular moments in time almost to perfection, not only does he seem to be in the perfect spot at the perfect time, but also the dialogue the human subjects have with the landscape, or rather, their surroundings. He captures a story in each image, and it always demands my attention. With so many great photographers choosing portraiture, it’s refreshing to see someone who had a knack for the moment and the environment. As far as I have seen, nobody after him has achieved such a blend of art and journalism photography. Witkin, too demands attention, for different reasons, and he stuck to a concept most artists wouldn’t dare attempt. One can hardly be neutral to his photographs, it has to cause a reaction, and he pulled this off essentially in studio environment, which is the least appealing place to me as a photographer. He is both a photographer and a sculptor, while his photographs are essentially paintings, and how many photographers have that versatility? As far as contemporary, more recent photographers, I would say Todd Hido has been my favorite. He has an uncanny ability to capture the spirit, the essence of a place. All of his projects are very different visually, but they have that one common thread. In today’s world where everything is over stylized and overstated, the fact that Hido’s approach is subtle is in itself is an achievement. BT: What’s the next step for your project and how do you see your future in photography? HM: Next is to complete the book I am currently working on, which will feature photos and stories from the project. I plan several such books because of the overwhelming amount of material, but each will be slightly thematically different. After that, I plan to exhibit the project where it is possible and appropriate to do so, ultimately I would like to communicate ideas behind the project to audiences, and use the images merely as illustration. Recently, I have been invited to present the project in a TEDx talk in Atlanta, which I think is a great platform to share the concept. It's an honor and I look forward to it.